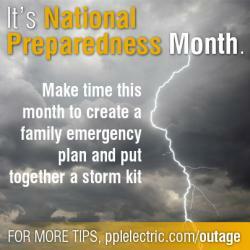 If you’re looking for a handy preparation guide you can print out at home, check out www.pplelectric.com/beprepared. Other helpful websites for preparedness information include www.ready.gov, www.redcross.org and www.readypa.org. The landing page of the utility’s website, www.pplelectric.com, often carries important messages about safety and preparedness. PPL Electric Utilities, a subsidiary of PPL Corporation (NYSE: PPL), provides electric delivery services to about 1.4 million customers in Pennsylvania and has consistently ranked among the best companies for customer service in the United States. More information is available at www.pplelectric.com/alerts.